Lance Klusener, Delhi’s newly-appointed consultant, believes exposure to youngsters will help India improve their overseas record. The Air Force Sports Complex in Palam is an awkward setting for interaction with former South Africa all-rounder Lance Klusener because conversations get frequently interrupted by the intermittent whirring sound of planes soaring above this ground situated next to the domestic terminal. “In all my years of playing and watching cricket, I’ve not experienced anything like this,” he quips. Hired as Delhi’s consultant for the limited overs leg (Vijay Hazare and Syed Mushtaq T20) for this season, Klusener has had a relatively quiet entry into the dressing room, keenly observing players from the background and jotting down notes in his diary. “It’s been barely a week now, and I’m feeling my way in,” he says about his new assignment. 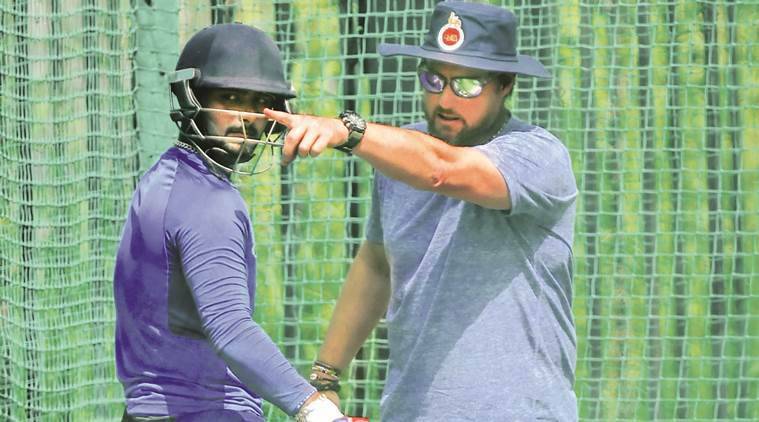 Since retiring from top-flight cricket more than a decade ago, the Durban native has been ‘living out of the suitcase’, crisscrossing the globe and accepting coaching assignments in several T20 leagues. In India, he was the mentor for the Mumbai Indians and Kovai Kings in the TNPL. “For me, coaching in India is the ultimate. One of the things I like about India is the amount of talent that’s on offer and response from the players is fantastic. That’s why I say this is the best cricketing nation. So, when Rahul Sanghvi called me and offered this role, I couldn’t refuse it,” he explains. Klusener terms the Indian Premier League a “phenomenon”, a competition that has singularly changed the dynamics of the game by providing an ecosystem for the bevy of domestic and international players to thrive in. However, he points out that there are other T20 leagues like the Big Bash in Australia and England’s T20 Blast that provide platforms for players. Consequently, he reckons youngsters on the Indian domestic circuit will benefit if they are allowed to participate in these leagues. “I really think they are missing a trick by not allowing youngsters in India to travel and play in such tournaments. Because the exposure they are going to get there will be enormous,” he notes. Klusener feels this move will put them in a better frame of mind when they get picked for India and travel to these countries. “Just imagine, you have a youngster with the experience of playing in the Big Bash, and when he gets picked to represent India in Australia, neither the conditions nor those big grounds will be alien to him.” This line of though could be all the more significant as current India skipper Virat Kohli has continually stressed on creating a team that can win in overseas conditions. Coming back to his current assignment, Klusener points out an interesting observation about the Delhi team’s batting, which he says mirrors that of the Dolphins, a South African franchise he was in charge of till recently. “These guys (Delhi) are reluctant to play the conventional sweep shot. Years back, even the Dolphins batters faced the same problem. But you could sympathise with them because they had not faced a lot of spinners back home.” According to Klusener, playing the sweep shot to spinners serves two purposes: Firstly, it forces the bowler to change his length, and secondly, it forces the opposing captain to manoeuvre the field. “If you play the sweep shot, the captain will move a fielder to square-leg. This opens up the field and improves the batsmen’s chances of scoring in other areas.” For all his cricketing acumen, Klusener is remarkably stoic — a personality trait that drew flak during his playing days. Like for instance, during the 1999 World Cup semi-final against Australia in Birmingham. Years later, Klusener in an interview to Luke Alfred, a popular South African journalist and author, said his mantra towards life and cricket was: “You’ve got to stay on your lily.” He believes that staying in his “bubble” was partly responsible for his team’s historic choke 19 summers ago. “I think so, because we needed nine runs off that final over and I struck two boundaries off (Damien) Fleming to tie the score. Even after I failed to score off the third ball, my intention was to finish it off with a boundary. In hindsight, if I had gone down and had a word with Allan Donald, it would have helped. But again, you never know… if I was bowled off that fourth ball, it would have come down to nothing,” Klusener reminisces. He goes on to add that people will relate the ‘chokers’ tag with South African cricket until they win the World Cup. “It’s something we have to contend with. We have historically done well in bilaterals, we just have not been able to cross the line in big ICC tournaments,” he says, displaying ice-cold stoicism. The 47-year-old attributes it to the unforgiving years in the Army during his youth. “I grew up in apartheid South Africa, where training in the Army was a given. I spent a lot of time in the bushes as a teen… perhaps that toughened me and shaped me the way I am,” he explains. After serving in the Army, a chance encounter with the late Malcolm Marshall paved his entry into first-class cricket. Five winters later, through another quirk of fate, Klusener would make his Test debut at the Eden Gardens in Kolkata in 1996. “I was not scheduled to play that match. Fannie (de Villiers) pulled out with an injury at the last moment, and I replaced him.” Duels with Azhar He had a rather inauspicious initiation into Test cricket, getting pasted around by Mohammad Azharuddin. He hit his straps in the second innings though, prising out eight scalps. But his duels with Azhar were his biggest takeaways. “India had some great players like Sachin, Rahul, Sourav and VVS… but Azhar was special. I really enjoyed my duels with him. He would hit me for a boundary, and come and nudge me. If I bowled well, he would complement me,” he recalls. Klusener would march on unflinchingly over the next eight years, even the two consecutive heart-breaks at World Cups did not scar him one bit. But when injuries began to take a toll, his prowess with both bat and ball began to wane. After a stint with Northamptonshire in England, he hung his boots to focus his energies on coaching. Even post-retirement, Klusener forces one to think about the game.